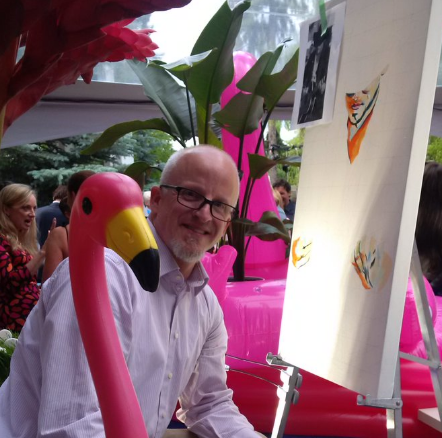 I was perched on an 8' x 4' riser in the middle of the huge tent that contained Brett Wilson's Garden Party, surrounded by food, a thousand guests, and a couple of fake flamingos. 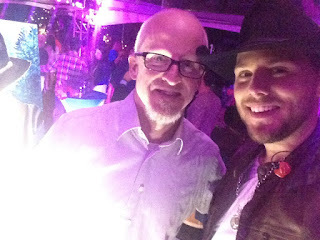 It was just after 8 pm when I started working on the portrait of country music superstar Brett Kissel. The plan was to present it to him as a thank you at the end of his performance. 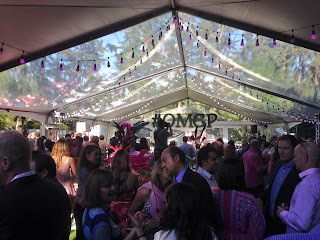 This was one of those live painting experiences that I knew I had to be super diligent about the task at hand. Of the four potential source photos I selected, this was the toughest as it included a number of challenging elements. I was a little flustered at the beginning when I discovered that one of my blues had leaked during the journey from Fort McMurray. Blue acrylic paint was everywhere and I spent the first 15 minutes managing the colourful carnage. I was very methodical about the painting process, starting with Brett's face and hands, then working my way to the guitar, clothing and background. My goal was to have the piece substantially complete by the time his set was over. I had about 3 hours. 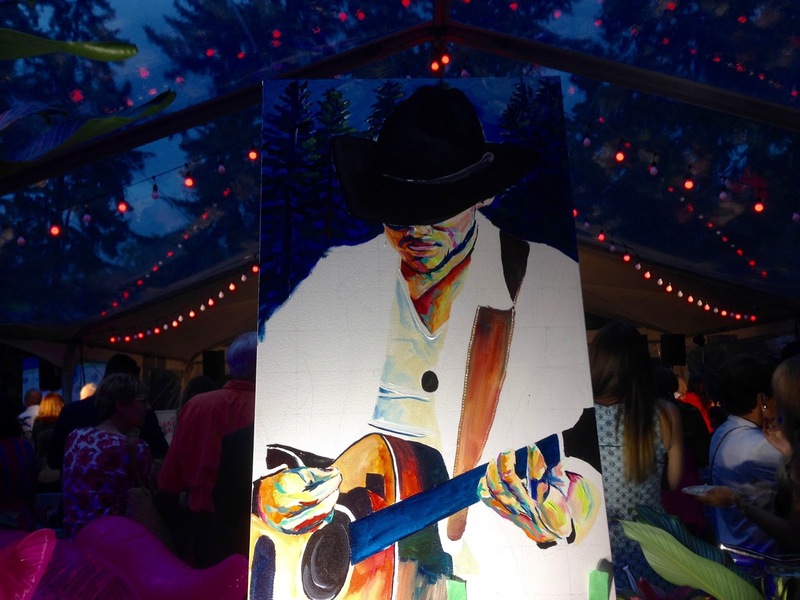 I have to say that painting in that incredible space, filled with happy and engaged Calgarians, while listening to some outstanding entertainers including Oscar Lopez and Brett Kissel, was intoxicating. At one point, while deciding what to do with the background, I looked up and saw the blue sky and trees that stand proudly at the perimeter of Brett's property. There it was: the perfect background for this portrait. I madly started applying the blue and white, then layered the trees on top with some dark green and crimson red. My brush was moving to the beat of the music. I imagine that I must have been amusing to watch. People were keeping an eye on me; to the left, to the right, and behind. 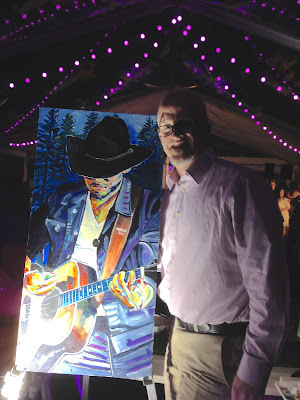 I really enjoyed some of the short visits and conversations that ensued as the painting came together. Working away, I would sometimes get the sense, in my peripheral vision that someone was watching. I glance over only to discover it was the faux flamingo, staring at me. I made that mistake four or five times that night. Near the end, I found myself laughing at the absurdity of it. I became quite fond of that very attentive bird. Brett Wilson came over to say hello near the end. What a nice guy - heart of gold - and sincere in his intent to be a force for good in the world. He had a great conversation with a young fellow whose life was completely changed because of the mentorship of a great program. I think it was called Outward Bound. I actually reached out to this young fellow on Instagram and am hoping to have a personal chat with him tomorrow. I was really affected by his story. Brett Kissel's reaction to the painting was beautiful. He appeared to be deeply touched by the work, and asked some great questions about it. He even shared that the guitar featured in the painting - a Martin - had only been played in public that one time. "If you ever need any help with any charitable stuff, just let me know," he said, as genuine a performer as I've ever met in my 25 years of meeting and talking with entertainers. 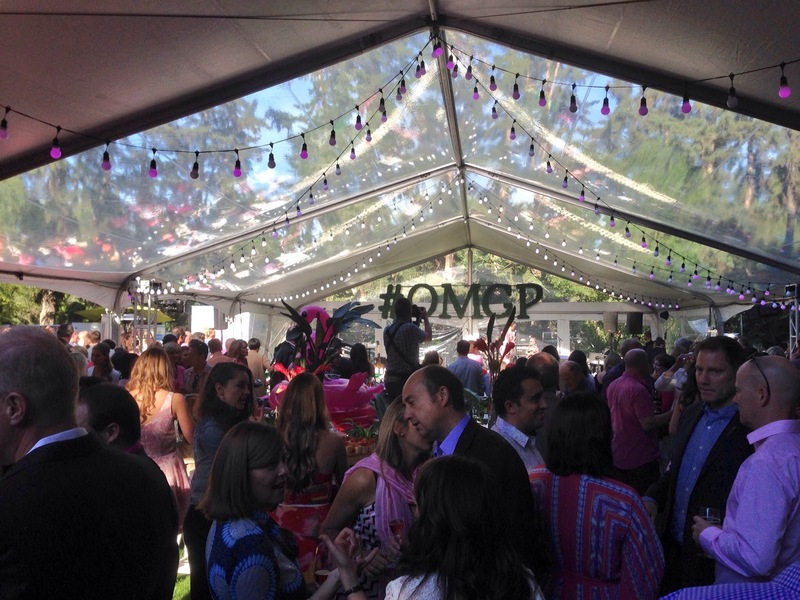 Everyone treated me so well at the Garden Party. 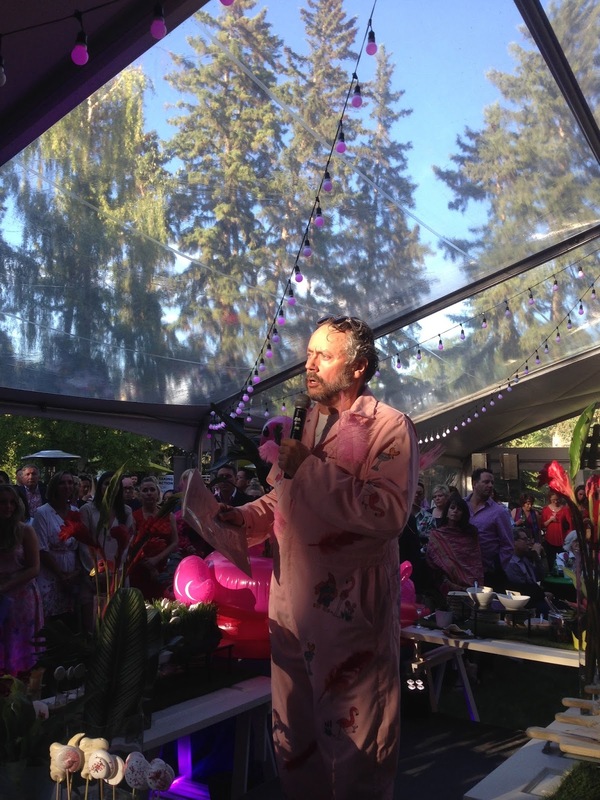 It speaks volumes to the type of company that Brett Wilson runs and the people he gathers around him. This was truly a delight for me, and if I'm asked to make a return visit in the future, I'll be back in the garden with bells on and my brushes at the ready. Where have all the ravens gone? What could they possibly have been thinking? What would Jim and Eric do?